This 3-day, trekking and cycling adventure will take you through the incredible scenery of Ba Be National Park in the northeast of Vietnam. You have almost three days packed full of adventure and cultural activities including jungle trekking, visiting ethnic villages, taking a boat cruise and biking around the national park. You will spend two nights in a local homestay in a Tay village which will give you the chance to meet the local people and experience their way of life. Tour Guides: Our experienced and friendly Tour Guide(s) speak excellent English. They are extremely knowledgeable about local cultures, history and the environment. You will leave Hanoi for Ba Be National Park early in the morning. 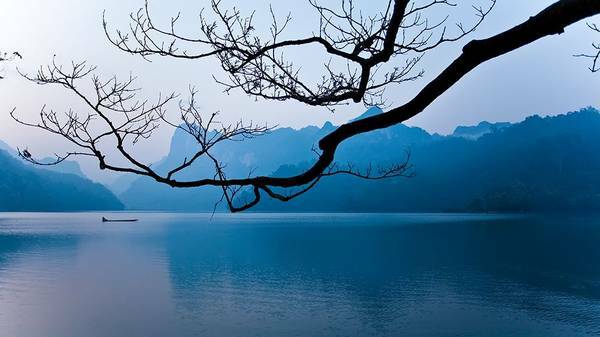 The beautiful Ba Be Lake is situated in the Bac Kan province, approximately 240 km northeast of Ha Noi capital. Today, on the way from Ha Noi you will pay a visit to the Thai Nguyen Minority and Culture Museum where you can discover more about the customs and traditions of the different ethnic minority groups in Vietnam. After having lunch at a local restaurant, you will continue your journey to Ba Be Lake. On arriving at Ba Be Lake in the afternoon you will have the chance to relax before your evening meal of locally sourced delicious food. You will stay overnight with a local Tay minority family in their traditional stilt house. At around 08:30, after breakfast, your tour guide will take you on a trek to Pac Ngoi Village where the local people live by fishing and growing rice and corn on the land of "Soi Bai". You will then walk along the edge of the stream to view the stilt houses. After, you will borrow bikes from a local family and cycle to the Tày ethnic village area where we explore an amazing cave in the mountain. The journey continues to Hua Ma cave and Silk Waterfall which is about another five km by bike. If it’s hot, copy the local kids and jump in and swim. You will have a picnic lunch beside the waterfall. In the afternoon you will return the bikes and walk around Ba Be Lake and try to capture some great photo shots of the sunset. We'll go to the local markets for souvenirs and then travel back to the homestay by boat. You will have dinner and spend the night in Coc Toc Village. After breakfast at the homestay, check out and leave the bags in the car. Don’t forget your camera though because today is a chance for some more great shots. Travelling on our private boat, you will go through the entire length of the 3 connected lakes (Ba Be - means Three Bays) and up the Nang River. You will continue down the beautiful river surrounded by flourishing wildlife until you reach the enormous tunnel of Puong Cave which measures and impressive 300m long by 30m high. This is the result of millions of years of erosion from the flow of the river. The boat will then take you upriver to a small Tay village. After some time in the village, it will be time to bid farewell to Ba Be as you start your return journey to Hanoi. You will be ped off at your hotel at around 17:00. * Please contact our travel consultants at sales@ultimateodyssey.com to get discount for big group OR special price for children (under 10 years old). * Private tour for a solo traveler is also available with a surcharge. Single supplement: applies for those who travelling with others but requires an single room for him/herself. Clean and comfortable homestays with air-conditioning provided. We choose local ingredients, typical of the way people eat in the area, at local restaurants, markets or homes. We also cater for Vegetarians but please request this at time of booking. You have already had an account? Please Sign In or Sign Up to send reviews. There are at least 2 reasons why you should book Ultimate Odyssey and tour on our website.